The initial bid document that later secured us the immortal 42.is domain name. The announcement from the bid on numberic domains from ISNIC 29th of May 2002. 42.is viewed in Internet Explorer (first version of page). The 42 group assembled on MSN Messenger. The time that this very photo album has been viewed 42 times. 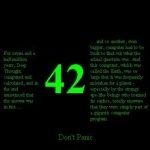 A special version of www.42.is to celebrate a friends 42nd birthday. The men behind 42.is. Photo taken before watching The Hitchhikers Guide To The Galaxy on DVD. The 42.is photogallery reaches the goal of 42 pictures on July 18th 2002. It had to happen. Our very first spam letter to 42.is. Interesting that this email address has never existed. The "Here and there" album hits 42 photos!